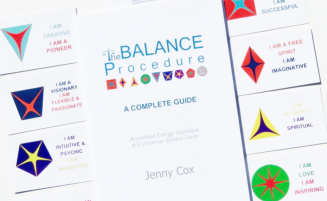 The Balance Procedure is a powerful energy technique that uses 9 symbol cards – no need to analyse or break it down. Use it for your relationships, your health, wealth, confidence, authenticity, and communication. The only one who can change your reality is YOU! The Balance Procedure quickly and easily brings your body into a state of relaxation. It is very easy to learn and use. When you are in a state of relaxation, you are in Balance. The Balance Procedure will help you to identify and change those blocks and beliefs that can cause you pain, fear, anxiety, anger, depression, etc., thus restoring physical and emotional balance. By counteracting everyday stresses in your life, you will be working towards achieving the health and happiness you desire in life. Self-Awareness is the point where your belief in yourself is so strong that you create all of your reality to your highest potential. The Balance Procedure (TBP) is a practical ENERGY technique to conscious awareness using HEART energy and Universal Symbols. TBP is a powerful unique energy technique and when used as part of your daily life it can increase your confidence, increase energy output and maximise potential. TBP is a self-help tool and when practiced daily, it can change the way you think and feel, enabling you to find your true potential and live a much fuller life, helping you to understand the true power of your thoughts and imagination. Using TBP enables you to learn how to focus your intention to create the life you want. We create our reality through thought and imagination – BALANCE is the KEY. TBP activates the Language of the Universe with nine symbol cards each representing a geometric symbol, affirmation, colour, number, zodiac, gemstone, element, planet, chakra, and physical aspect and how when all is Balanced, it is the key to the unconscious mind. TBP is an energy technique that does not require an understanding of theory or precise disciplines but is learnt through practice. Knowing how it works is not as important as doing it. Rather than using the rational, intellectual level of consciousness, it requires the development of flexibility and expansion of consciousness and mindfulness.